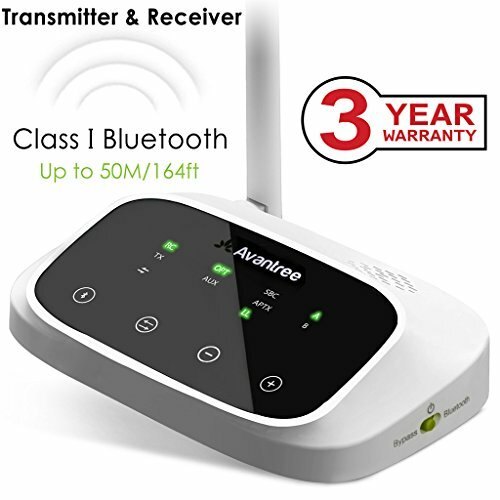 Avantree Oasis 2018 New Version is a long range Bluetooth audio transmitter & receiver incorporating the latest “aptX low latency” technology, for CD-like quality sound with virtually no delay. Multifunctional support optical, bypass and voice prompt. Provide the best solution for your TV or home audio systems to wireless stream hi-fi audio directly to any wireless headphones or speakers. 164FT LONG RANGE: Utilizing Class 1 Bluetooth technology and an optimized antenna design, the Avantree Oasis can achieve a range of up to 164ft (50m) in open air line-of-sight conditions and up to 50-70ft (20-30m) indoors. Use TWO Oasis units as a Transmitter and Receiver Set to EXTEND range even further. NOTE: Operation range can be affected by physical obstructions (walls, people, etc. ), wireless interference (Wi-Fi routers, Wireless TV adapters etc.) and also depends on receiving device. AUX & OPTICAL: Supports both analog (RCA / 3.5mm aux audio) and digital (optical) input and output! NOTE: Please set your TV audio settings to PCM format as the Oasis doesn’t support Dolby / DTS format when using optical mode. IMPORTANT NOTICE: LA-based support 800 232 2078 or email with <24H response time. 1) Low Latency is NOT supported in Dual Link mode (use Avantree Priva III for this) 2) Dual Link works best for same brand/model of headphones. Conditions in which Dual Link may not work as well - 2 speakers, 1 headphone + 1 speaker, 2 different brands/models of headphones. Suggest to use with Avantree Audition Pro. [Contact support if advice/help needed].